carbonated water, high fructose corn syrup and/or sucrose, citric acid, taurine, natural and artificial flavors, sodium citrate, sodium benzoate (to protect taste), ginseng extract, caffeine, carnitine fumarate, maltodextrin, niacinamide (vitamin B3), yellow 5, pyridoxine hydrochloride (vitamin B6), guarana extract, cyanocobalamin (vitamin B12). Coke has finally come up with an energy drink that looks and tastes better than KMX. Why they waited so long, we'll never know, but Full Throttle clearly reflects some hard time at the drawing board. The lightly carbonated citrus flavor is refreshingly and has a mild bite to it. Both its flavor and its yellow-green color remind us of AMP, while the packaging resembles a number of other products in the category. 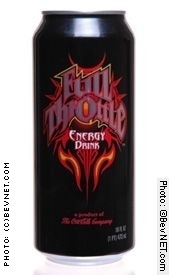 These similarities should ease its belated entry into the hard-charging 16 oz energy drink category, but Full Throttle is going to need solid marketing support to catch the likes of Monster, Rockstar and SoBe No Fear.